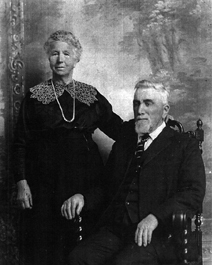 Oscar's mother Hannah (shown in photo on the right) remarried Richard Russell a presiding elder of the Mormon church and father of a family of girls. She and Oscar were converted into the Mormon church in England and Oscar was baptized on April 1864 by Richard Russell (3). They all emigrated to Utah in October 1864 (2). They sailed on the ship "Hudson" from Liverpool on the June 3, 1864, arriving in New York July 19, 1864. They crossed the plains under the direction of Capt. Wm. Hyde's Company. There were 863 saints under the direction of John McKay in that company. In the Wm. Hyde ox train there were 62 ox drawn wagons and a large company of emigrating Saints, mostly funded by the Perpetual Emigration Fund which loaned money to the poorer saints to emigrate and then they were to pay the money back after they got established in order for more saints to be helped to emigrate. The ox train left Wyoming, Nebraska on Aug 9, 1864. They traveled with another company led by Snow and were the last of this season's emigration. They had to pass through a region where the Indians had committed some depredations upon some non-emigrant trains. Also in Capt Hyde's company was Elder Parley P. Pratt returning from a European mission. During the journey 2 men, 6 women and 5 children died. One of those was Oscar's new stepfather Richard Russell who had baptized Oscar before they left England.He died at Wyoming, Nebraska on Aug 16, 1864. (For more details on their travels, read Journal History of Church Oct 26, 1864. p. 3-9, on microfilm at BYU FH Library and at Church Archives in SLC.) After arriving at SLC, Oscar and his mother were sent to Wanship to settle on Oct 17, 1864. From there they went to Peoa to make their home. His mother married again, James Garner of Peoa and lived there till she passed away at age 83 on June 5, 1892. Oscar had to take care of himself at the very early age of 13. From the time his mother married James Garner, Oscar had to pay a set sum of $25/month for board and room and clothes to his stepfather until he got out on his own. Oscar had received some common school education in England and attended school in Peoa for one winter after coming to Utah. He worked with his stepfather in general farming until 1868. The at age 17, Oscar went to the Black Hills of Dakota to work on the Union Pacific railroad grading following the railroad until it reached Ogden in the fall of 1868, Oscar was then able to buy a team and took a subcontract on the railroad grade. Later he farmed on shares in Peoa and after a time was able to buy his own land and helped organize and promote the South Bench Canal Co. as President. He took a prominent part in all matters pertaining to irrigation. He filled the position of manager of the Coop store in Peoa several times for a period of 9 years and then engaged in the mercantile business himself starting in one room of his home for two years, after which he built a new home for his family. He owned 135 acres of good farming land all under cultivation and well irrigated. He kept 60 head of stock on his place and was prosperous in the community. In political life, he was in the Democratic party and active in Summit.Co. At age 19, on Oct 17, 1870 Oscar married Elizabeth Durrah in the Endowment House in SLC. She was also a Mormon convert who came to Utah at a young age 8 years before Oscar had made the trip to America. 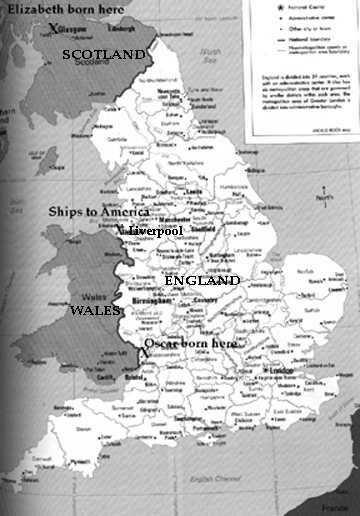 (See map above to see where they had both lived in United Kingdom. )She was born to Henry Durrah and Jane Donely (also sometimes called Jean Donnelly) in Glasgow, Scotland on Jan 1, 1852. Elizabeth was just 6 weeks old (Ancestral file says Elizabeth was 3 years old) when her Mother died, living one son and a grieving husband. It is thought Henry Durrah left that area of Scotland in search of employment and the new baby was left with Jane's sister. The baby's aunt Elizabeth Donely Maxwell and her husband Ralph took care of her sister's baby Elizabeth Durrah. Evidently the Maxwells were converted to Mormonism about this time and they left Scotland in 1856 to migrate to Utah. After they arrived in Boston, Mass., they traveled on to a campground near Iowa City, Iowa and joined the Daniel McArthur Handcart Co which consisted of 487 saints, 100 handcarts, 5 wagons, 25 oxen, 4 mules and 25 tents. (9) The handcart company of Daniel D. McArthur consisted of 487 people, 100 handcarts, 5 wagons, 24 oxen, 4 mules and 25 tents. Elizabeth Durrah was only 4 years old at the time of this great journey. July 25th-traveled 20 miles to Elkhorn River where we found a camp of friendly Indians. The chief was very helpful and took one of the carts and pulled it to camp about 1/4 miles. This was quite an exertion on his part and although he was a tall strong looking man, it made the perspiration run down his face. July 26th-crossed the Elkhorn River by roughly constructed ferry. The company had to pay $6 for all to pass. Traveled 15 miles without any water until we came to the Platte River where the water was a joyful sight. July 27th- camped all day on the north bend of the Platte River. Most days we traveled 20 miles pulling and pushing our handcarts and walking along beside them. Food was a bit of bread and a pint of milk morning and evening this was supposed to feed 5 people. Aug 3rd-Sunday, started at 5 o'clock without any breakfast and had to pull the carts through 6 miles of heavy sand. Some places the wheels were up to the boxes and it was difficult to pull because many were weak from thirst and hunger and the pain of boils that afflicted many in the camp. About noon a thunderstorm came and the rain fell in torrents. In our tents we were standing up to our knees in water and every stitch of clothes they had on was wet as if we were dragged through the river. The rain continued unto 8 pm the following morning. Aug 16th- This morning an old woman belonging to our company was bitten by a rattlesnake in the leg and before half an hour her leg swelled to four times its thickness. She was administered to by the Elders and we started again, but unfortunately as we were starting another old woman was run over by one of the wagons. The front wheel went over her thighs and the back wheels over her shins and singular to say although the wagon was laden with 32 cwt of flour, not one of her bones was broken. This day we had the most severe day's journey we had since we started and traveled over 20 miles of heavy sand hills or bluffs. Besides having to ford many streams. All seemed to be fully worn out when we got into camp. Aug 17th-Sunday. In camp all day. Spent the day washing and mending my boots. Aug 24th-Sunday. Camped all day at Chimney Rock. Spent the day mending clothes, washing, baking and cooking. On the 22nd while on the road traveling we were overtaken by a very heavy thunderstorm which wet us all to the skin, but as soon as it was over we went at it again and made a journey of 7-8 miles before we camped and then we had to lie on the wet grass all night and go to bed supperless there being no firewood to cook, the buffalo chips being wet. We had to ford 20 steams this week. Aug 28th- After traveling 12 miles through sand, came to Fort Laramie where after crossing the river getting some wet trousers and petticoats we remained all night, Passed many camps of Indians, all peaceable. Sept 4th Crossed Muddy Creek and traveled 20 miles late in the evening forded the Platte again for the last time. We are always up at daybreak preparing to start at 5 . We meet the wagons at Deer Creek with supplies from the valley. There were 5 wagons, one for each company with 1000 lbs of flour in them. Sept 5th Very wet today. Could not start it rained so much. Snow four feet deep on the mountains all around us. Bands and carriages formed a line facing the line of handcarts to welcome them and President Brigham Young spoke a few remarks and gave them a blessing. Then the companies pitched their tents to rest in Zion thoroughly fatigued but thrilled to have arrived. As they entered Utah in Echo Canyon, her aunt Elizabeth Maxwell died and was buried in the canyon near Cache Cave. Elizabeth Maxwell's oldest son Arthur then took care of Elizabeth Durrah. After reaching Salt Lake, Arthur married and with his wife raised Elizabeth Durrah but she was not legally adopted by them. Elizabeth Durrah was baptized 5 Sep 1861 at age 9 after she had arrived in Utah. Elizabeth settled with the Maxwells in Peoa, Summit, Ut. Little is known of her childhood. Later she would met Oscar Wilkins. Settling down in Peoa, Oscar farmed on shares and after a time was able to buy his own land. He was a successful farmer and rancher. He was one of the organizers and promoters of the South Bench Canal Company of which he was president. He took a prominent part in all matters pertaining to irrigation. He filled the position of manager of the Co -Op Store in Peoa several times covering a period of 9 years. He also engaged in the mercantile business for himself starting a store in one room of his home for 2 years after which he built a new home for his family. He owned 135 acres of good farming land all under cultivation and well irrigated. He kept 60 head of stock on his place and was prosperous in the community. 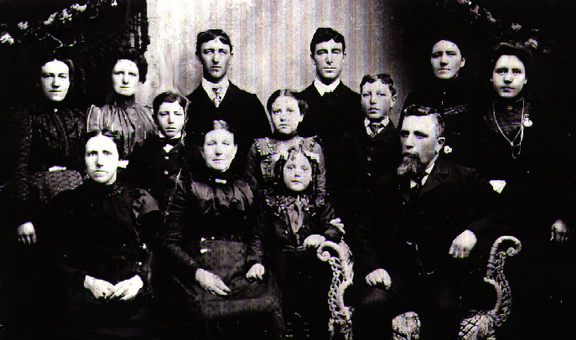 Middle Row-Reuben Ralph, Lillian Pearl, Albert; Back Row-Sarah Janette, Clara Ellen, Oscar William, George Edgar, Hannah Elizabeth, Mary Alice. Not shown Herbert who died at age 3. From an Interview with my grandmother Mildred Stevens Vernon about her grand parents, the Wilkins, I found out the following information. Mildred: Grandpa (Oscar) Wilkins owned the store in Peoa and its still standing there and he left that to go out homesteading in the reservation ( in the Uintah Basin, now Duchesne County). Bonnie: They left a prosperous business and his home and went out there and started all over again and they were getting on a lot of years then. On July 9, 1908, Oscar, his wife, daughter Pearl and Edith and son Ruben moved out to Mt. Home to a one room log house which was finished except for shingles, doors and windows which they brought with them. It was here they started their life in Mt. Home. The house was finished and tents pitched for bedrooms. In a few days, the wagon started back to Peoa, Elizabeth and her daughters were ready to go back with it to Peoa but Oscar was excited with the new project. (5) Oscar homesteaded some land in Mountain Home which is just directly over the mountains from Kamas through the Wolf Creek Pass going East. I'm not sure his family shared his enthusiasm but they supported him nonetheless and became pioneers again in a new and undeveloped area of Utah. There were only three children left at home when they pulled up their roots and started over in Mountain Home. Most of the children in the Wilkins family followed their parents and homesteaded in the Uintah Basin also. They drove to Boneta for church and it wasn't long until Oscar was sustained as presiding elder until he was put in as Bishop of the Mt. "Home ward on September 10, 1911. By this time, the people had built a chapel at Mt. Home. (See photo on right.) Their oldest son George Edgar had preceded them to the Basin when he came to Vernal in 1909 to farm. He had been a missionary to the Southwestern States in 1898-1900, Then he married Zina Miles in 1901 and served another mission this time to Great Britain in 1903-1905. He was called to be Bishop of the Vernal second ward. Another son Reuben Ralph Wilkins was a Bishop of the Mountain Home ward in 1929-1930 following in his father's footsteps. The winter weather in the Basin can be severe and dangerous. Oscar Wilkins, the second oldest son of the family married Ella Moyle and was superintendent of the Wasatch County schools. 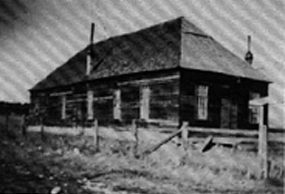 They had a homestead in Mr. Home at the present site of Doll Lyans' farm. During the Christmas holidays, he had been in Mt. Home with his family. His wife and children were living in Mt. Home in order to keep up the assessment on the homestead. He had decided to return to Peoa in spite of the bad weather because of his job with the school district in Summit County. A few days after he had left, his father Oscar sent a letter to find out if he had made the journey safely. At that time, there were few phones and when it became evident that he had never reached Peoa, a search party was organized. One group started at Peoa and another at Mt. Home and traveled the same trail Oscar had used. 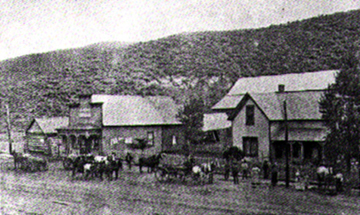 Seven miles east of the Stewart's Ranch the groups met. In between them was a great mountain of snow covering the trail. It was concluded that he must be trapped in the snow slide. The group began excavation of the slide to locate the body or sight of the team and sled. Tunnels were dug in all directions, straight down and from the edges, but the snow was so deep they had no success. Finally, the men had decided that it was useless to tunnel any further and the next morning they were going to abandon the search and wait until spring. In Peoa Oscar had served his fellow-citizens as a justice of the peace, school trustee and road supervisor. His occupation was a farmer, stock raiser and merchant. He also served in the Territorial cavalry during the Indian troubles in the early days. (3) After he moved to the Uintah Basin, he was ordained a Bishop of the Third ward in Roosevelt Stake. He was sustained as Bishop of the newly created Boneta Ward in Dec 1910 until 1913. The ward was created from a division of the Roosevelt and Theodore (Duchesne) wards. He was ordained a Bishop for Mt. Home Ward on Sept 10, 1911 by Francis M. Lyman. In Sept 1913, the north side of Boneta Ward was separated to form the Mountain Home Ward and Oscar Wilkins served as Bishop of that ward from 1913 to 1920. (1 ) So he served 10 years as a Bishop then when the Duchesne Stake was organized, Oscar was chosen a high counselor. He was made a Patriarch of that stake in 1921(2) and held this position until his death in 1930. Elizabeth Durrah Wilkins was also active in the church and in the community in Peoa and in the Uintah Basin. She was set apart to be a midwife by Stake President Smart in the Uintah Basin and she delivered many babies throughout the Basin while also giving birth to 12 children of her own. She listed the number as 265. During this time, the midwife moved in with the family after the birth of the baby for at least 10 days which was the length of confinement for the new mother. The pay in those days was always minor as people had so little material wealth in those days. She delivered her last baby March 9, 1933 at age 84. (2) She was also a nurse for all illnesses in the community. With no hospitals or doctors closer than Vernal or Heber City which was 50 to 100 miles away, she even made medicine from natural herbs such as hops, golden seal, sulphur, peppermint, raspberry leaves, cayenne pepper, ginger root and more. Some homemade remedies that helped with influenza and canker among many other things. She had two strengths, one stronger than the other for adults. (5) She was truly an angel of mercy to hundreds of people who praised her name. Many times she would grab her little black bag and go on a minute's notice, often sitting in the bottom of the wagon. She would say to the driver, "I dare to ride as fast as you dare to drive." She took food and clothing from her own home when it was not found in the home of the patient. She was truly a great lady and a friend to all who knew her. (9) She delivered babies for all of her own girls. Oscar died June 11, 1930 at Mt. Home and Elizabeth died Jun 9. 1937. He was 79 years old. She lived 7 more years after his death until she was 85 years old when she died. They both lived long active and very productive lives. Firm in their testimonies of the restored gospel till the end of their lives. Both are buried at the Boneta Cemetery near Mt. Home. Let us not forget the example of their lives of service to their family, church and communities they lived in. (4) Notes from taped interview with Mildred Stevens Vernon (grand daughter of Oscar Wilkins, daughter of Clara Ellen Wilkins Stevens) and her daughter Bonnie Vernon Williams in 1974 in Milford, Utah transcribed by Lin Floyd. (6) Church Emigration 1864 Captain Wm. Hyde's Company (see also Journal History of Church Oct 26, 1864, p. 3-9 and Deseret News Weekly of Oct 19, 1864 for a roster of company-Deseret News Weekly Vol 14, p. 18 and see also Journal History Sept 2, 14, Oct 19, 25, 26 & Nov. 2, see also John Lyman Smith in Company f98-diary into end of Aug 64 msd 2072fd5 start Sept 64 all located at LDS Church Archives in SLC. (7) Handcarts to Zion by LeRoy Hafen, p. 71-79, 250-215 taken from Kate B. Carter (compiler) Heart Throbs of the West, SLC: DUP, 1944, VI, p. 359 also used the Bermingham diary. (8) "Snowslide" told by Edgar and Rue Miles, story of death of Oscar Wilkins Jr.
(9) Pioneer, Women of Faith and Fortitude by DUP, vol. 4, p. 3372 "Elizabeth Durrah Maxwell Wilkins"
© 2003 Lin Floyd, to contact me for more information, sign my guest book on my Main page.